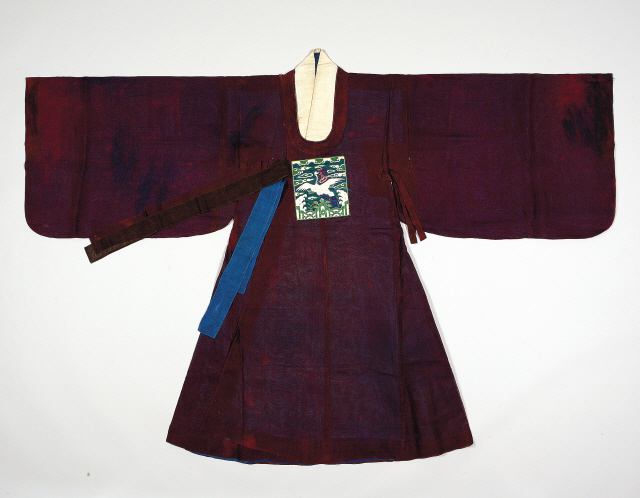 In the Joseon Dynasty, there was strict division among social classes over what clothes they would wear. But there was one day in everyone’s lifetime when even a commoner would dress up like royalty: their wedding day. Men wore samogwandae, the official government attire. This consisted of a hat, belt, boots and danryung, a dark blue robe. “Dark blue was the color of officials’ robes at the time, so many people emulated the robe in the same color,” Ahn Hee-jae, CEO of Korea Event, told The Korea Herald in a phone interview. Privileged grooms who were officials wore their own robes at their wedding. Poor people who could not afford to buy wedding clothes would pool their money to buy one and take turns, or borrow one from a friend, explained Ahn, whose company specializes in reenacting and exhibiting traditional culture. Also, the government provided poor grooms with high-ranking official robes, a horse and even low-ranking officials to carry torches in front of the groom’s parade. Thanks to this, even the poorest man was able to make a grand entrance at his wedding ceremony, which was usually held at the wife-to-be’s house. Brides were permitted to dress in the formal attire of a princess. 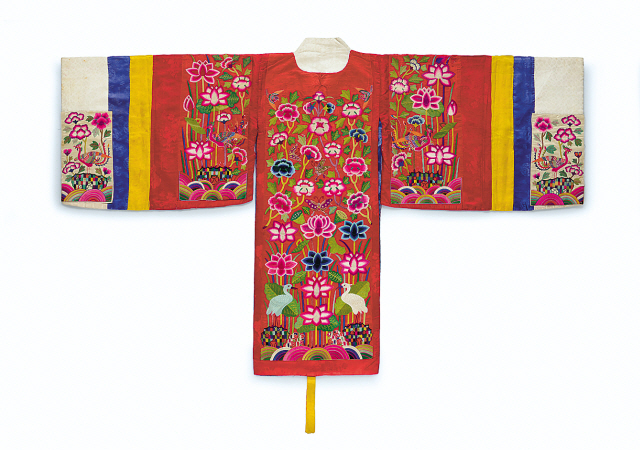 In the early Joseon period, female courtiers wore wonsam, which dates back to Unified Silla (668-935). Queens wore red wonsam while princesses wore green at official events. For her wedding, even a commoner bride was able to wear a green wonsam. There were strict guidelines on embroidery, size and patterns of the dress, and commoners were not allowed to wear a wonsam decorated with gold thread. Nonetheless, the bride was able to wear it and look her prettiest. In the late Joseon period, hwal-ot became more popular. Hwal-ot is made of brilliant red fabric. Though similar to wonsam in shape, hwal-ot was embroidered with sipjangsaeng, 10 natural elements that represent longevity. Phrases such as “iseongjihap” (good relationship between the couple) were sewn on the garment as well. Traditional weddings called for special food. Before the wedding ceremony, the man’s family sent a nabpye chest to the woman’s household. The nabpye chest held a letter which finalized the courting procedure and dowry. The groom’s family prepared a special rice cake called bongchi-tteok, which they placed under the precious nabpye chest like a platter. This was so that the chest would not touch the ground, which was considered unlucky. The bride’s family also prepared a cake, and when they received the chest they placed it underneath the chest. The cake consisted of 3 dwae (5.4 liters) of glutinous rice and 1 dwae (1.8 liters) of red beans. The cake was prepared in two layers to represent the couple, and had one chestnut in the center surrounded by seven jujubes. The color red was thought to ward off misfortune and evil spirits, while jujubes symbolized fertility and sons. The sticky, glutinous rice represented the hope that the newlyweds would be inseparable. The wedding table, which is central to the ceremony, is rich in symbolism and hopes for happiness as well. With the table in the center, the groom stood to the east and the bride stood to the west. On the red, tall-legged table, there were two rows of chestnuts, jujubes, white beans and red beans to symbolize longevity and good fortune. It was customary to place a rooster on the east side of the table wrapped in red cloth, and a hen on the west side wrapped in blue cloth. The rooster’s beak and comb represented valor and promotion, and the hen represented fertility. 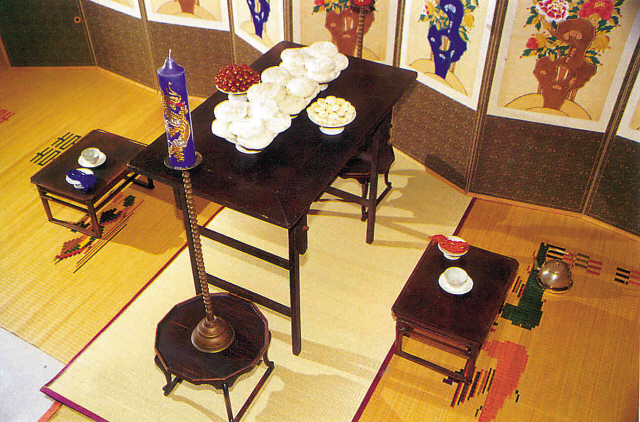 A pine branch and bamboo branch were set on either side of the table, symbolizing loyalty and fidelity. Following the ceremony, the newlywed couple went to live at the groom’s house. Upon arriving, the bride proceeded with the pyebaek ceremony. In this ceremony, the bride officially greeted her new parents-in-law for the first time and served them a meal. The bride prepared chicken, jujubes, wine and meat jerky. She presented these with gifts from her family, which differed among seasons and regions. With the pyebaek, the bride was fully inducted into the husband’s family. Though many of the wedding traditions have been Westernized and simplified, most mothers still wear hanbok at their children’s wedding and newlyweds tend to wear hanbok at the banquet to greet the guests. Professional pyebaek guides lead newlyweds and parents through the complicated ceremony, keeping the tradition alive.